After many years of buying and selling pottery, I have been fairly successful in identifying pieces both marked and unmarked. But this one stumps me! The ink stamp reads 'art Moderne, which I think may be the retailer. The other marks are very tough to read- possible a C and A (modified feet) under an arch of blocks or stone. 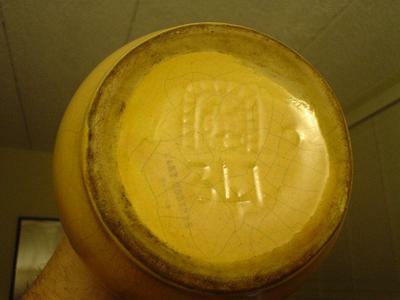 The mold or model number is 3 4 (modified) and 1. I have searched every data base I know of still come up with nothing. I was guessing the "moderne" meant a European potter, but of course the potter and retailer could be oceans apart. This is the first time I have used this site and hope that someone brilliant will come to my rescue! I think our best bet is to see if we get other folks Googling "Art Moderne" and see where we go from there.